Located amongst some of the most spectacular and unspoilt scenery on the Costa Brava, your dream holiday will become a glorious reality the moment you set foot in this wonderful luxury camping site, just 400 metres outside the lovely fishing town of Calella de Palafrugell. Shaded by majestic pine trees, with stunning beaches and coves close by, discover why the region is considered one of Catalonia’s best kept secrets. 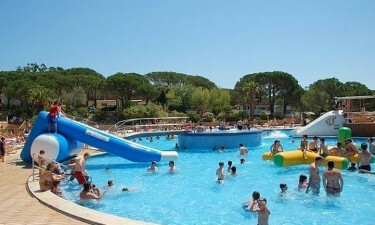 Why come to La Siesta for a camping holiday? 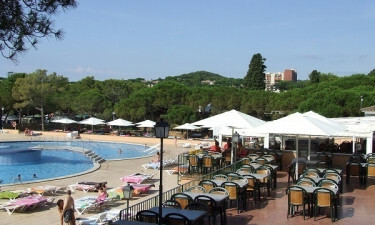 La Siesta has 2 large pools with terrace areas and sun-loungers, plus a children’s and toddler’s splash pool. There is a special play area for children and a popular Kid’s Klub in July and August for 5-12 year olds, with entertainment organised by the staff. In the evening during high season there are stage shows and live entertainment around the illuminated pool. Tennis, football, basketball, volleyball, table tennis and billiards can all be played on-site. 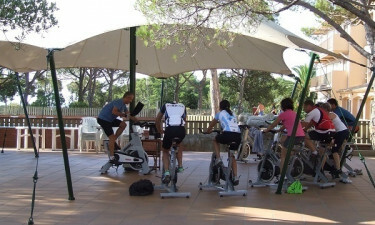 A well-equipped gym will keep those muscles toned, whilst spinning classes and aqua aerobics are available in high season for trimming that holiday waistline. Guided hiking and mountain bike trips provide an ideal opportunity to discover the natural wonders of this region on one of the many coastal or inland trails. Those who prefer to explore at their own pace can rent a bicycle. The tranquil beaches, sandy coves and rocky inlets with their warm and crystal clear waters are a paradise for swimmers, divers, snorkelers and sun worshippers alike. 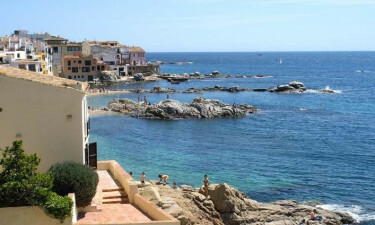 After working up an appetite with an invigorating swim or dive, head into Calella de Palafrugell, Llafranc or Tamariu. Little has changed over the years in these picturesque seaside towns. Be sure to sample some of the delicious regional seafood dishes at one of the many fine restaurants, or for a relaxing drink or coffee try one of the many terraced cafés and bars. In the evening, why not join the locals for a traditional leisurely pre-dinner stroll on one of the pretty promenades? There is a restaurant serving a variety of tasty dishes and a bar with pool terrace for drinks and snacks. The takeaway stand offers pizza, grilled chicken and burgers. For luxury camping convenience, a modern supermarket caters to all your immediate needs. Fresh bread and sweet pastries are available from the bakery and the gift shop offers an excellent selection of keepsakes and souvenirs. Alternatively, take a stroll into Calella de Palafrugell and shop at the colourful daily market for local fresh produce, fish and meats. The market is open from Tuesday to Saturday and there is a street market every Sunday.